Children 1-3 years old, and a parent/caregiver, will enjoy this lapsit session with books, music, rhymes, simple concepts and various activities with Ms Wendy every Tuesday for this 9 week session. 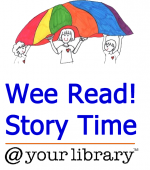 Library story times help develop social, emotional and language skills. Capacity: 1 of 1 space available.